When Victoria Miller and her backing band, Wheat, broke out with a string of gold records in the sixties, the sultry chanteuse seemed shy of crowds, refusing to perform in public. Years after her last success, Victoria makes her stage debut, but the magic is long gone, and shortly after that, so is she - the victim of a brutal murder. Victoria's six-year-old daughter, Allison, is missing too, but nobody's come forward for a ransom. The only clue is a mysterious call - I'll be stopping by to collect - but who's collecting, and what? Even if Allison could be found, lawyer Matthew Hope can't seem to locate Victoria's missing will with Allison's guardianship. And when Victoria's old producer comes forward, claiming Victoria wasn't quite the natural talent she'd seemed to be, Matthew's left wondering who gave her the golden touch and why they'd take it back right now. 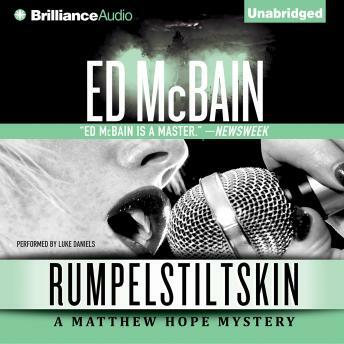 Part of Ed McBain's masterful Matthew Hope series, Rumpelstiltskin finds the good-hearted lawyer in a plot where everyone's a suspect, and all debts are paid in full.